I spent a couple months in Alaska prospecting for gold in the summer of 2014. That adventure was chronicled as it happened here on the forum at Steve's 2014 Alaska Gold Adventure. It was a great trip and a great adventure, but when I told it I relayed the fact that it was actually part two of the story. Part one happened in 2013 and for reasons you will now discover I kept quiet about it until now. Those interested in the logistics of making the trip to Alaska and details on where I stayed, etc. will find all that covered in the 2014 story so I will not repeat that stuff here. 2013 was a momentous year for me. My business partner and I had sold the business we started together in 1976 to our employees in 2010. My partner immediately retired but I stayed on a few years to oversee the transition. Things seemed to be going well enough that I announced my retirement to take place in the spring of 2013. My wife and I had purchased a new home in Reno, Nevada and so plans were made to sell our home in Alaska and move south. At the same time, some partners and I had acquired some mining claims on Jack Wade Creek in the Fortymile country near Chicken. Alaska. My plan was to move my wife south then spend the summer gold dredging with my brother. The disaster struck. I screwed up the paperwork and the claims were lost. That mess was described online at Making Lemonade Out of Lemons and I even wrote an article for the ICMJ about it. I was not to be deterred however and made plans instead to go metal detecting for the summer. Unfortunately, my brother also had a change of plans and so was unable to make the trip with me. Just as well as I ended up having my hands full. The house sale was in progress and time running out so I boxed and palleted everything we wanted to keep and shipped it south. Then I loaded my wife and dogs up in the car and drove them to Reno. Next I flew back to Alaska and had a last big garage sale. I sold everything I could by the afternoon and out a FREE sign on what was left. Worked great - the house was empty, I cleaned it up, and pretty much left it to the realtors at that point. Finally, on June 16th I jumped in my fully loaded truck and headed for the Fortymile! On the way up just past the town of Palmer on the way to the town of Glenallen you pass Sheep Mountain in the Talkeetna Mountains. It is a very colorful, mineralized peak and it was a beautiful sunny day so I stopped and took this photo. Early Jurassic greenstone and minor interbedded sandstone and shale is intruded by numerous mafic dikes and at least one body of unmineralized Jurassic granite. Greenstone has been hydrothermally altered and contains at least 6 separate gypsiferous deposits in altered zones along joints and shear zones. Deposits composed of pods and stringers of gypsum, quartz, alunite, kaolin minerals, pyrite and serpentine minerals (Eckhart, 1953). The gypsum-bearing material averages 25 to 30 percent gypsum, with a maximum of 50 percent. In addition also reported from same general area are: (1) small irregular quartz-calcite-epidote veins in greenstone containing chalcopyrite, malachite, azurite and possibly bornite and chalcocite (Berg and Cobb, 1967); (2) disseminated chalcopyrite in greenstone over 5 ft thick zone subparallel to bedding (Martin and Mertie, 1914); (3) trace gold in samples of pyritic greenstone (Berg and Cobb, 1967); and (4) minor anomalous concentrations of copper and gold associated with some of the alteration zones and nearby veins (MacKevett and Holloway, 1977). Large area of south flank of Sheep Mountain is stained dark red from oxidation of pyrite in greenstone (Berg and Cobb, 1967). Oxidation of Cu minerals. The gypsiferous material averages 25 to 30 percent gypsum, with a maximum of 50 percent. The six deposits indicated and inferred reserves contain about 659,000 short tons of gypsum material, of which about 50 tons of this material had been mined (Eckhart, 1953). In addition, about 55 tons of clay was mined for the manufacture of fire brick and boiler lining. Samples of pyritic greenstone assayed trace gold (Berg and Cobb, 1967), and nearby veins in alteration zones show concentrations of copper and gold (MacKevett and Holloway, 1977). We did a talk radio show for many, many years at our company. The latest of several "radio personalities" to work with us on the show was Kurt Haider. 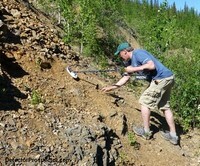 He had expressed an interest in metal detecting so I invited him up to look for gold. I met him along the way just before we got to Glenallen and headed on to Tok for a bite to eat at Fast Eddie's. Then on to Chicken and finally Walker Fork Campground by evening. This is a very nice, well maintained BLM campground at the mouth of Jack Wade Creek where it dumps into the Walker Fork of the Fortymile River. The campground hosts this summer were a very nice couple named Pat and Sandy. The next morning Kurt and I ran up the creek to find Bernie and Chris Pendergast. They were spending the summer camped along Jack Wade Creek prospecting and I was anxious to see how they had been doing. Not bad, they already had over an ounce of gold found before we arrived, and that got Kurt and I all fired up to go look for gold. I had told Kurt, a total newbie, that I had a sure thing. We were going to hit a bedrock area I had detected the previous summer and where I had found a lot of nice fat little nuggets. There was rubble and little piles of dirt, and I thought all it would take is moving the rubble and dirt aside and we were sure to find gold I had missed. We got started after lunch on a steep slope where it was easy to just rake material off and then check with a detector. The location turned out to not be very good, but Kurt did manage to find one little nugget, his first ever. He was real happy about that! We did not work at it all that long though with the late start, and Chris and Bernie had invited us over for moose stew. Chris is a fantastic cook so we enjoyed both the stew and a DVD packed full of Ganes Creek photos from the couples adventures there. Finally we called it a night and headed back to our camp. Now time to get serious! Kurt and I grabbed the picks and rakes and spent the whole day tearing into some berms left behind by the miners bulldozers on the bedrock bench area. I just knew we were going to find gold for sure. We would both do hard labor for awhile, then I would put Kurt on the ground with my Gold Bug 2. We worked a couple hours. Nothing. No big deal, just need to move a little more. Nothing. More digging and scraping. Nothing! I would have bet $100 we were not only going to find gold there but do pretty well. The spot had produced quite a few nuggets before and I had refused to believe we couple possibly had cleaned it out. But by the end of the day it was a total bust. We finally just wandered around a bit detecting and I lucked into a little 3 grain nugget. What a letdown. No big deal for me but I was really wanting Kurt to do well and this was not working out anything like I had thought it would. The next and last day for Kurt we decided to hook up with Bernie and just give it a go like we normally do. And that means hitting the bushes and tailing piles wandering around looking for gold. Kurt had his MXT Pro and Bernie and I our GPX 5000 detectors, so we had a horsepower advantage for sure. Still, I was hopeful as we put Kurt on the best spot that Bernie knew of from his extra time before us. Very first beep, Bernie digs up a 3 pennyweight nugget! Yeehaw, we are going to find gold!! We all hunt away, with Bernie and I checking in with Kurt periodically. Kurt, it seems, just was not destined to have any beginners luck at all; Bernie and I each found a couple 1-2 gram nuggets by the end of the day but Kurt came up dry. I was feeling kind of bummed out but Kurt insisted he was having a huge adventure, and come to find out he rarely ever got out of town at all, so this really was a big adventure for him. I just wish he could have found more gold, but he was up early and headed back to town the next morning. I was on my own now, so I rigged my GPX 5000 up with my Nugget Finder 16" mono coil and hit the tailing piles. All day. For no gold. However, just by myself that is really no big deal at all. It happens all the time and I do not think anything of it. If anything, the pressure was off trying to help a friend find gold, so it was a relaxing day wandering around. Saturday, June 22 started out sunny with a few clouds. There were some tailing piles across the creek I had been wanting to detect. I had hit them a bit the year before and just dug trash, but had not put in more than a couple hours at it. Still, they looked real good and I had been thinking about them all winter and decided it was time to give them a go. I started out with my GPX 5000 but immediately got into some old rusted metal, like decomposed and shredded can fragments. I just was not in the mood for it that morning, so went back to the truck and got out my Fisher F75. The F75 had done well for me in the past hunting trashy tailing piles and was along on the trip for that reason. I got near the top of the pile with the F75 and on getting a signal looked down and saw a dig hole full of leaves. I try to recover all my trash and get frustrated when I find holes with junk in them. The signal though was flaky, not a distinct trash signal, so I figured I may as well see what the other person left in the hole. I gave a quick scoop with my pick, and gold pops out of the hole! I am not sure if the person was using a VLF and the specimen gave a trash signal, so they left it after half digging it, or maybe they were using a Minelab, and the signal just sounded "too big" so they left it for trash. Too big indeed, they walked away from a 2.37 ounce gold specimen! To say I was stunned would be a vast understatement. The trip had only just begun. The best part of all was that my expectations for the trip were very low. I had been hoping that a month of camping and detecting would get me a couple ounces of gold. That would be more than enough to cover my expenses and make a few bucks. Yet here I was on the sixth day of my trip, and I had already exceeded that amount. This was just great on several different levels, not least in pretty much taking every bit of pressure off going forward. Here is that specimen from a more detailed account of the find I told previously at Fisher F75 Strikes Gold in Alaska! I had to take a break and go show Chris and Bernie my good fortune. Then I switched back to the GPX 5000 and got with digging everything, including all those bits of rusted cans. Funny how a nice chunk of gold changes your perspective. That, and seeing what somebody else had left behind as trash. This adventure continues as a thread on the DetectorProspector forum with many more photos and details. View it all here.